This article is about fish body oil and not fish liver oil. Fish oil can be found in fatty fish, such as anchovies, halibut, herring, mackerel, menhaden, mussels, oysters, salmon, sardines, seal blubber, trout and whale blubber [1,25,26,27,28,29,34]. Fish oil extracted from fatty fish is available as a dietary supplement in the form of capsules or liquids. Fish oil contains high amounts of nonessential omega-3 polyunsaturated fatty acids eicosapentaenoic acid (EPA) and docosahexaenoic acid (DHA). 3 oz (85 g) of fatty fish contains 0.8-1.8 g of EPA + DHA (herring, meckerel, salmon and sardines contain most) [30,31,34]. One fish oil softgel (1 g) usually contains 0.6-1 g of EPA + DHA and various (small) amounts of saturated fat, cholesterol, vitamins A and D, and 9 Calories [32,33]. Lowering high triglyceride levels, especially when taken along with cholesterol-lowering drugs statins [3,22]. It is not clear if lowering triglycerides by fish oil protects against coronary heart disease or not. NOTE: Fish oil supplements may not provide any additional health benefit in individuals who regularly consume fatty fish . There is INSUFFICIENT EVIDENCE about the effectiveness of fish oil in the prevention or treatment of  abnormal heart rhythm, acute respiratory distress syndrome (ARDS), age-related macular degeneration, aggression, antisocial personally disorder, anxiety, bacterial infections, bipolar disorder, cancer [45,46], chemotherapy side effects, chest pain, chronic obstructive pulmonary disease (COPD, bronchitis), clogged arteries, common cold, cystic fibrosis, dementia, depression , diabetes mellitus type 2, eczema, epilepsy, fatigue, fibromyalgia, gallstones, glaucoma, gout, hearing loss, high blood pressure (hypertension) [19,20,21], HIV/AIDS, ichthyosis, inflammatory bowel disease (Crohn’s disease , ulcerative colitis ) or other inflammation, kidney conditions (IgA nephropathy, nephrotic syndrome, stones), leprosy, liver disease, malaria, migraine, morning stiffness in rheumatoid arthritis [4,5,6], multiple sclerosis, nerve pain, osteoarthritis, osteoporosis, panic disorder, pancreatitis, Parkinson’s disease, peripheral artery disease, psoriasis, Raynaud’s disease, retinitis pigmentosa , schizophrenia, Sjögren’s syndrome (dry eyes and mouth), stomach disorders, stroke, systemic lupus erythematosus, transplant rejection or vasculitis, or in improving appetite, athletic performance, cognition or immune functions, longevity, memory, sun protection, surgical recovery, vision, weight loss, wound healing or as an antioxidant or blood thinner (anticoagulant). There is INSUFFICIENT EVIDENCE about the effectiveness of fish oil in prevention or treatment of infertility  or prostate cancer . There is some concern that fish oil supplements may actually increase the risk of prostate cancer . There is INSUFFICIENT EVIDENCE about the effectiveness of fish oil in prevention or treatment of breast pain, decreased risk of allergies in children (when taken by women during pregnancy) , premenstrual syndrome (PMS)  or in improvement of pregnancy and labor or fertility . There is probably no good reason for healthy children to take fish oil supplements. Infants should get supplements only under doctor’s supervision. There is INSUFFICIENT EVIDENCE about the effectiveness of fish oil in prevention or treatment of asthma  or attention deficit hyperactivity disorder (ADHD) , autism , dyslexia , phenylketonuria  or sickle cell disease  or in infant developing . Children should avoid fish high in mercury, such as shark, swordfish tuna and tilefish. Commonly used doses of fish oil for adults for different purposes are 0.6-20 grams per day for few months to few years . Discuss with your doctor before taking any fish oil supplements. 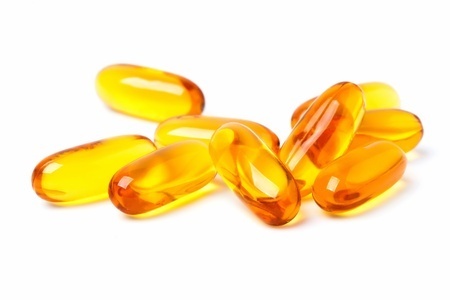 Fish oil supplements are LIKELY SAFE when used in recommended doses for up to 2-3.5 years . Up to 20 grams of fish oil supplements per day may be tolerated by most adults . Fish oil, when taken in recommended doses, is POSSIBLY SAFE during pregnancy and breastfeeding . The U.S. Environmental Protection Agency (EPA) recommends that pregnant and breastfeeding women limit sport-caught fish intake to 6 ounces per week and avoid other fish that can be high in mercury, such as king mackerel, shark, swordfish and tilefish and to limit other fish to 12 ounces per week . Fish oil is pregnancy category C, which means that not enough studies have been done to establish if it is safe for the unborn babies or not . Who should avoid fish oil supplements? Do not take fish oil if you are allergic to fish. Children, pregnant and breastfeeding women, anyone with diabetes, hypothyroidism, liver or pancreatic disorder, drinking excessive amounts of alcohol (more than 2 drinks per day) or taking contraceptive pills, blood thinners, beta-blockers, diuretics or other drugs should speak with a doctor before taking omega-3 supplements . Other possible side effects or risks of fish oils supplements [9,37]: acid reflux, anemia, anorexia, asthma, bad breath, bad taste in the mouth, bloating, blood in urine, blurred vision, bronchitis, burping, cataract, colon cancer, common cold, constipation, lowered immunity, depression, diarrhea, excess fat in the stool, excessive urination, excessive gas, excessive sweating, fever, impotence, mania, memory problems, muscle, joint, back, chest or neck pain, nausea, nosebleed, prostate cancer , sleep problems, tingling (paresthesia), vertigo, vitamin E deficiency, vomiting and weight gain. Toxicity – How much fish oil is too much? Fish oil is Generally Recognized As Safe (GRAS) according to the U.S. Food and Drug Administration (FDA) . There is an increased risk of bleeding with doses greater than 3 grams per day . There is a small risk of mercury poisoning by consumption of large amount of fatty fish such as shark, swordfish, king mackerel, tilefish (golden bass or golden snapper), farmed salmon and albacore tuna [2,9]. Fish oil supplements do not likely contain dangerous amounts of mercury [9,44]. Some fatty fish, such as herring, farmed salmon, sardines, trout and tuna can also contain high amounts of polychlorinated biphenyls (PCBs). There is little chance that fish body oil supplements taken regularly, long-term and in large amounts may cause vitamin A or D toxicity . NOTE: Fish liver oils, such as cod liver oil (but not fish body oils) may contain more than 180,000 IU/g of vitamin A. The acute toxic dose of vitamin A is 25,000 IU/kg (10 fish-liver oil capsules taken by a 70 kg or 154 lbs individual), and the chronic toxic dose is 4,000 IU/kg (1.5 fish liver oil capsules by a 70 kg or 154 lbs individual ) every day for 6-15 months . Fish oils supplements taken along with blood thinners, such as aspirin, clopidogrel, heparin or warfarin, or supplements, such as Ginkgo biloba, garlic and saw palmetto, may increase the risk of bleeding .